Even pets need special care and assistance during seasonal changes. The skin of the dog too dries up like us and therefore when you have a dog in the house you have the responsibility of taking care of their body as much as you love playing with them. MirahBelle has gone a step forward in introducing to you a magical formula which works best for pets today in moisturizing, conditioning and protecting the skin from further damage. The Dog Paw Balm is a soft creamy balm which soothes the skin and provides it with essential nourishment and healing. It is Neem oil, jojoba oil and lavender essential oil-based formula which works effectively in providing relief to sore, dry and cracked paws. The Dog Paw Balm also serves as a great aid to dogs dry and irritated skin and therefore is a must for your little puppy that needs a little pampering. Neem Oil: Neem oil as a natural anti-oxidant, anti-fungal and anti-inflammatory property aids in making the dog skin free from any irritation or burns resulting in curing the skin from within. The special magic of the oil is to cleanse the impurities and provide an instant remedy to heal the skin irritation and give relief. When your dog is suffering through cracked paws and burns the Neem oil present in the Dog Paw Balm works like magic to not just clean the area but also sooth the burning sensations to provide a thorough healing. It acts as the natural cleanser, medicine and relief to the pain. Miscellaneous Ingredients: The Other ingredients present in the Dog Paw Balm are the lavender essential oil, Bergamot essential oil, jojoba oil, Shea Butter, Extra Virgin Olive Oil, Sunflower Oil and Beeswax. All of the ingredients are known to be powerful in healing the skin from within and aid in the soothing of the pain that comes with burnt, cracked or irritated skin. 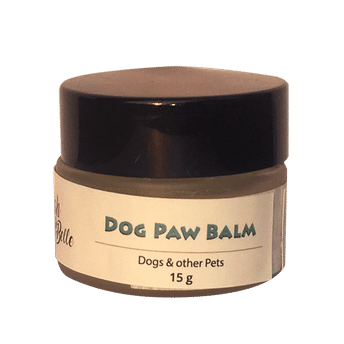 The application of the Dog Paw Balm from MirahBelle on a regular basis will aid in bringing comfort to the dog and heal their cracked paws in just a matter of days to let them enjoy as much as they would like to without any pain.